Dr. Brown takes the time to explain the results of your eye exam, describe your options and listen to your eye care needs. Because maintaining good eye health is an ongoing partnership, we encourage you to ask questions and share your health information, which could be vital to monitoring, diagnosing and treating potential vision problems. 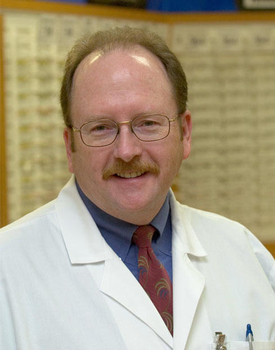 Dr. Brown attended the University of Wisconsin and Marquette University and is an honors graduate of the University of California School of Optometry. He opened his practice in the Cartersville Walmart Vision Center in 1995 and practices there exclusively. Dr. Brown has extensive experience in family eye care including contact lens fittings and routine exams for adults and children. He is certified to prescribe therapeutic medications and has received advanced training in the detection of eye diseases, LASIK surgery co-management and fitting of complex contact lenses. Dr. Brown’s professional interests include the use of advanced technology in eye care and electronic medical records. Dr. Brown is one of the most experienced doctors in Walmart. He now has served over 20 years as an Independent Doctor of Optometry with Walmart and he was the first Director of Professional Relations for the company. He was also named the Regional Doctor of the Year on three occasions over his career. Outside the office, Dr. Brown enjoys restoring antique boats and outboard motors, biking, hiking and kayaking. Dr. Brown and his wife, Holly, reside in Waleska, Georgia.